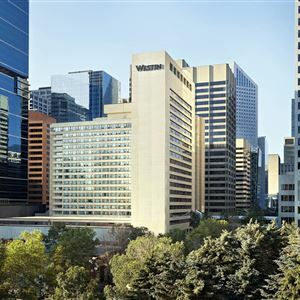 Property Location A stay at The Westin Calgary places you in the heart of Calgary, walking distance from Knox United Church and TD Square. This 4-star hotel is within close proximity of Devonian Gardens and Calgary Chinese Cultural Centre. Rooms Make yourself at home in one of the 525 air-conditioned rooms featuring refrigerators and flat-screen televisions. Your room comes with a pillowtop bed. Complimentary wireless Internet access is available to keep you connected. Private bathrooms with shower/tub combinations feature designer toiletries and hair dryers. Amenities Take advantage of recreational opportunities offered, including a health club, an indoor pool, and a sauna. This hotel also features complimentary wireless Internet access, ski storage, and gift shops/newsstands. Dining Enjoy a meal at a restaurant or in a coffee shop/café. Or stay in and take advantage of the hotel's 24-hour room service. Quench your thirst with your favorite drink at a bar/lounge. Business, Other Amenities Featured amenities include a business center, limo/town car service, and express check-in. Self parking (subject to charges) is available onsite. 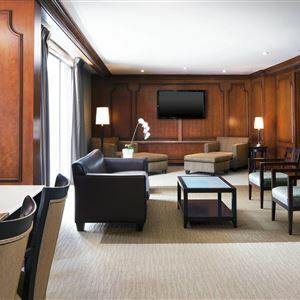 A stay at The Westin Calgary places you in the heart of Calgary, walking distance from Knox United Church and TD Square. This 4-star hotel is within close proximity of Devonian Gardens and Calgary Chinese Cultural Centre. Make yourself at home in one of the 525 air-conditioned rooms featuring refrigerators and flat-screen televisions. Your room comes with a pillowtop bed. Complimentary wireless Internet access is available to keep you connected. Private bathrooms with shower/tub combinations feature designer toiletries and hair dryers.